Zgoo - data inspection tool. This will scan _G for tables that could be add-on SavedVars (it's a heuristic, not 100% reliable), and show what it finds in regular Zgoo window. Last edited by Phinix : 06/15/16 at 10:09 AM. Thanks for this, really needed to get rid of a few characters I had from beta. Hope someone updates it one day. Last edited by Mitsarugi : 11/20/15 at 05:16 PM. Could you fix /zgoo mouse? It doesn't seem to work , need it to find out node Id's for FastTravelToNode for my addon. and then in "salesData" find & delete unwanted item (there should be a list of itemIDs, which you can get from itemLink). Last edited by Garkin : 04/01/15 at 08:43 AM. No idea, I don't use it so don't know how it stores data. I was having trouble with metatables whose __index is _G (now skipped), or an auto-vivifying function (avoided via rawget). In the process I changed _G scans to use zo_insecureNext, optimized collapsing tables, and a few other tweaks here and there. Hopefully not breaking anything. Ok there you go. As for the keybind, I added another one for /zgoo mouse, leaving the original as is. Well, I thought this would be a one-off thing, I don't intend to maintain Zgoo. But I can add these small things, with the exception of copy they're all trivial. Could we get a copy button for each line? I think to masscopy can be difficult but 1 line is easy to do. Last edited by Ayantir : 03/02/15 at 01:04 PM. I had made the GetTradingHouseSearchResultItemLink change to my local one sometime back. 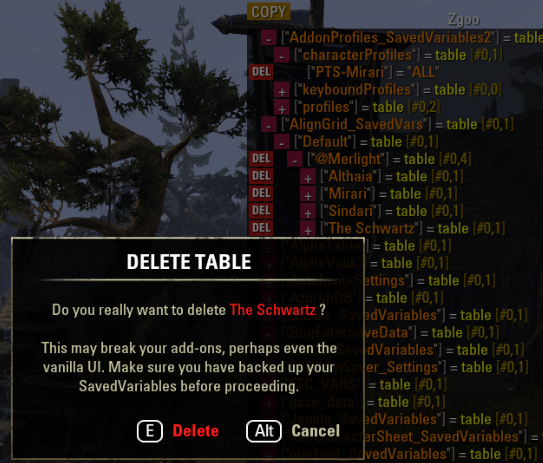 The editbox with select is a great idea. I toyed with routing to savedvars as a hack but editbox is a better way to go. Thank you for this change to Zgoo, new function will be useful. - There is another dangerous function which can cause crash to desktop: GetTradingHouseSearchResultItemLink. Please add it to the BLACKLIST table.